Jerusalem, December 14, Interfax - The Holy Trinity Cathedral of the Russian Ecclesiastical Mission in Jerusalem was vandalized early on December 11. 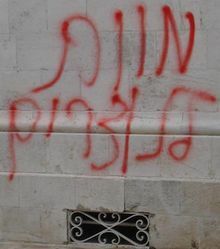 'Death' and 'Death to Christians' were written in Hebrew in large red letters near the cathedral altar and ante-church, the Russian Ecclesiastical Mission said. A statement was made to the Jerusalem police. There have been threats to clerics of the Russian Orthodox Church and other Christian confessions before, the mission said. The hooligans said that Christians must leave Jerusalem before they are massacred.